Stunning dinosaur bone wedding ring set with white sapphires set in sterling silver by Hileman Silver Jewelry. This wedding ring set has three pieces of gray dinosaur bone inlaid on each side of 3 pave` set sparkling white sapphires in the center. The three white sapphires in his ring total .12 carats and are set in a triangular cluster. His wedding ring measures 6.3mm wide at the top and tapers to 5mm wide at the bottom (shank). The matching woman's dinosaur bone wedding ring is scaled just slightly smaller than the man's wedding band. The 3 white sapphires in her wedding ring total .09 carats. Her ring is 5.6mm wide at the top and tapers to 3.2mm wide at the bottom (shank). The matching dinosaur bone wedding rings are stamped .925 sterling and hand signed "MMH" by Mark McBride Hileman. This dinosaur bone wedding ring set is priced for men's ring sizes 8 to 11 and women's ring sizes 4 to 8. Larger sizes will be more to cover the additional cost of wax work and silver. Your new dinosaur bone wedding ring set will be made to order in your ring sizes in about 4 to 6 weeks. Just select your ring sizes from the drop down ring size options. You may customize this ring set by substituting other inlay materials for the dinosaur bone or other gemstones in place of the white sapphires. Additional charges will apply if your choices are an upgrade. Men's ring style # MD257 and women's ring style #WD186. 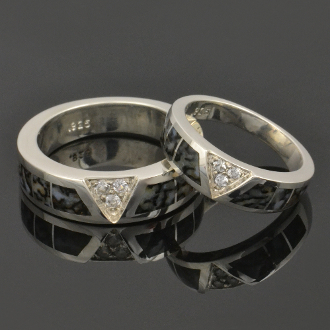 This set is also available in his and his and hers and hers ring set combinations as well.